This 238 page softback contains little known information regarding the first three months of the war in the Far East involving primarily Air Force personnel, especially the other ranks. It is in two parts, the first involving a little known RAF unit, the RAF Auxiliary Tung Song, a 549 ton coaster owned by the Straits Steamship Company, which had been requisitioned at the start of the 39-45 war by RAF Far East Command to transport stores etc.to bases in the Far East. This ship was the last British ship to sail from Java in March 1942 with evacuees. The second part deals with activities at the port of Tjilatjap and the stories of personnel who converged on the port. We now know that there were 5000 RAF personnel at Tjilatjap when the Tung Song sailed and they became POWs. Working together from opposite sides of Australia, Ron Lovell in Western Australia and HughCampbell in Tasmania have drawn together this story of the Royal Air Force Auxiliary Tung Song and her sailing from the little known port of Tjilatjap in Southern Java in March 1942. In doing so, they have touched on many facets of the fall of Singapore and the part the Royal Air Force played in those dark days. Hugh Campbell, who had been an officer in the Australian corvette, HMAS Tamworth, stumbled on the name Tung Song when he was working on a book about the Australian corvettes that were part of the British Pacific Fleet in 1944-45. He found that his Commanding Officer, Lieutenant D.B. Lloyd-Jones, RANR(S) had arrived in Australia as the Chief Officer of Tung Song carrying RAF evacuees from Java. 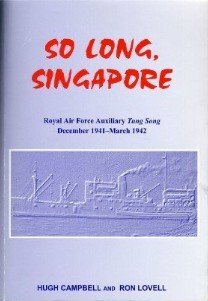 Ron Lovell was able to answer many questions about Tung Song, since he had spent several months as a member of the RAF detachment aboard that ship. Having found a common interest in 1994, the authors have worked at finding others who knew about Tung Song's voyage from Tjilatjap and the events that preceded it. Here is the result of their efforts. Price : £15.00 including postage. Cheques payable to 'So Long Singapore'. David Lumbard, 2 Smileyknowes Court, North Berwick, EH39 4RG.